True memory loss is a symptom in which a person experiences an abnormal level of forgetfulness and inability to recall past events in their life. But what’s considered normal memory loss? Is memory loss simply a part of aging and is there a way to slow it down? To find out, we talked with Dr. Krishnankutty Sathian, a neurologist and chair of neurology at Penn State Health. Description – The video begins inside the office of Dr. Krish Sathian at Penn State Health. Two people are standing next to each other. Standing from left to right is Scott Gilbert and Dr. Krish Sathian. Scott Gilbert – From Penn State Health, this is Ask Us Anything About Memory Loss. I’m Scott Gilbert. Well we all forget things from time to time. Especially as we age. It seems like our memory is not exactly what it once was. Today, we’ll learn about the difference between routine forgetfulness and actual memory loss, including causes and treatments from Dr. Krish Sathian. He’s a neurologist and chair of neurology here at Penn State Health. Dr. Sathian, thanks a lot for your time today. You know, I think a lot of people, when they think of memory loss, they wonder what is normal for you know, what is that normal forgetfulness look like? Versus something that’s a little more severe. So what are some of the things that we may forget from time to time and it’s okay? Dr. Sathian – Right. So I mean, I think that’s a great question. So we all forget things all the time. And forgetting is actually a very important normal mechanism for the brain. Because if we didn’t forget a few things, so we didn’t forget a lot of things, our memory would get totally overloaded. So it is important to forget. Now of course there are some things that we want to remember that we do forget. And this can be quite normal. So particularly, probably what’s most helpful to know is that if you don’t pay attention to something, then you’re going to be more likely to forget it. So let’s say you’re driving into the parking lot, normally you park on the fifth floor, but you’re a little late for work today so you didn’t get your normal parking spot on the fifth floor, so now you’ve got to park on the sixth floor. And you’re in a big hurry. And you didn’t really pay attention that you’re parking on the sixth floor, you’re running for your meeting because you’re already five minutes late. So then you come back in the evening and you go all over the fifth floor and it’s oh my god, my car’s not here. I forgot. And that’s okay. You just didn’t pay attention. It’s like you had those, remember those old calculators, you had a store button and then you have a recall button? I always tell people, if you didn’t press the store button then when you hit the recall button, maybe in the evening when you go to get your car, you’re not going to find it because you didn’t store it. Dr. Sathian – Completely normal. Scott Gilbert – So there are things that we do in the course of the day, perhaps because things are very hectic or we’re stressed and we just simply forget and that’s normal? Dr. Sathian – That’s right. That’s completely normal. So I would say that really what we tell patients about and patients often come in with this sort of complaint about you know, “I’m forgetting something but I’m not sure if it’s normal or not.” Usually the index is you know, if it’s significant enough that it’s going to affect your daily level of function, so it’s happening consistently and regularly and perhaps other people are beginning to notice, that’s when it’s probably something that you need to worry about and it’s more than normal. Scott Gilbert – Okay, you’re watching Ask Us Anything About Memory Loss from Penn State Health. I’m Scott Gilbert alongside Dr. Krish Sathian, who welcomes your comments and your questions in the comment field below this Facebook post. Just feel free to add those in the comment field. And we’ll get to those whether it’s live or even if you’re watching this video on playback, we’ll make sure that we do get an answer for you as well. You know, I feel like when it comes to some little details, data, numbers, dates, some people are better at remembering those than others. Is that true, and if so, why? Dr. Sathian – Well, so, you know, I think that’s one of the great things about humans, about people, is that we’re all so different. And we all have different strengths. So for some people, they’re going to remember those numbers and dates a lot better. For other people, it’s going to be remembering faces much better. Of course, you know, there’s a lot of variation. Some people can remember faces much better than others. So I think that’s just part of the normal variation that’s sort of the richness of our human race, that we just love and like to celebrate. Scott Gilbert – Well said. What are some of the factors that contribute, I’d say, actual memory loss. So like actual diagnosable memory loss. And maybe we should pause there and talk about what is the difference between a diagnosis of memory loss versus, again, that simple forgetfulness? Clinically. Dr. Sathian – Right. So first I would say that memory loss is not really a diagnosis, it’s really a symptom. And we really only like to call it memory loss if somebody’s complaining of memory loss and then we actually test that person objectively and find some objective evidence on testing that there is evidence of memory loss. So that’s really what we sort of define clinically as memory loss, which can be symptom of something bigger, sometimes it can be the first symptom of something serious, and so on. But again, as I said, if you’re just forgetting something, as we get older, we have a lot more things to remember. So forgetting, there is some normal forgetfulness that tends to increase with age, but again, if it’s not effecting your daily function, that’s something that you really don’t need to worry about that much. If it’s serious enough, you’ll know. And others will know. And that’s when you need to come to the doctor and get checked out. Scott Gilbert – In terms of clinical reasons for memory loss, like you say, it’s moreso a symptom of something, what are some of those things, especially in younger people, we’ll talk about the older population here shortly. But when it comes to younger people, what are some more common clinical reasons you see behind the memory loss? Dr. Sathian – Right, so that’s a very good question. So let me start by sort of thinking about the simple things that, you know, could cause trouble with memory and may not really be due to anything source. So let’s say you didn’t get a good night’s sleep. Well, the next day your memory’s probably not going to be so good. So now maybe you’ve got something that’s causing chronic problems with sleep, you know, on a daily basis, you know, it could be something as simple as you’re just stressed, you’re just worried, maybe you’re a little bit depressed, maybe you changed jobs and it isn’t everything that you expected it would be. So those kinds of things, you’re not sleeping well. And then because you’re not sleeping well, your brain really needs that sleep to function optimally. So then you might get into a state of just you know, not remembering things as well. And then that might make you a little bit more anxious, a little bit more stressed. So it could set up a vicious cycle. Scott Gilbert – So how do you encourage people to try to solve that problem? Scott Gilbert – A range of health issues have medications that could cause this as a side effect. Dr. Sathian – That’s correct. That’s correct. And then of course, okay, then there’s medical conditions. There’s a lot of medical conditions that can tend to impair your memory. So for example, if your thyroid gland, this gland in the neck, that synthesizes thyroid hormone, if that’s not working well, either it’s producing too much or too little, if can impair your memory. If your level of vitamin B12 is low, that can impair your memory. Scott Gilbert – How can you tell if your B12 is low? Dr. Sathian – So that’s one of the first things that we do if a patient’s coming to us, regardless of the age, and one of the complaints is memory loss, we run some very simple blood tests that can check whether your vitamin B12 level is low. And it can check whether your thyroid function is high or low. And so those are very simple tests and we really like to do this and I always explain to patients hey, the reason we’re doing these tests is because there may be some very simple things that are very easy to treat if we find them that can help them with your memory. Scott Gilbert – You’re watching Ask Us Anything About Memory Loss from Penn State Health, we welcome your questions for Dr. Krish Sathian, a neurologist and chair of neurology here at Penn State Health. Just add them to the comment field below this Facebook post and we’ll make sure we ask them of the doctor again, whether or not you’re watching this video live or if you’re watching it on playback. And we can get you an answer in writing. We do have a question right now from Darnell who’s wondering if there’s a connection between memory loss and dementia? It seems like that is perhaps one of the most common symptoms of dementia. Dr. Sathian – Right. So memory loss can certainly be an early symptom of diseases that lead to dementia. So and people don’t often, so maybe let me step back a moment here, because people often get confused and ask me this question. So what’s the difference between Alzheimer’s and dementia? Dementia is really a collection of diseases that sort of manifest the same way. And what really happens with those is that you have trouble with different aspects of your cognitive function. For example, with memory as we were talking about, in some cases it may affect language, in some cases it may affect what we call executive function, which is how we sort of organize the tasks that you need to do. And when you have impairment in those things sufficient to interfere with your activities of daily living, we call that dementia. And there are a number of diseases that can cause dementia, of which Alzheimer’s disease, which you’ve all heard about, is the most common. It’s the most common cause of dementia. The second most common cause of dementia, and by the way these are worldwide, Alzheimer’s is the most common cause of dementia worldwide, and the second most common cause of dementia worldwide, including the United States, is what we call vascular dementia. Scott Gilbert – Because what you’re saying is not every case of dementia is Alzheimer’s disease. The two terms are not synonymous. Dr. Sathian – They’re not synonymous. But statistically, Alzheimer’s accounts for a large proportion of cases of dementia and that’s why people sometimes tend to sort of conflate those two. So the vascular dementia as I was saying, it used to be called hardening of the arteries. You can think of it as narrowing of the small arteries going to your different parts of your brain and so that impairs the blood supply to your brain and that can cause vascular dementia. Now in both Alzheimer’s and vascular dementia, oftentimes one of the earliest symptoms is memory loss. And in that kind of memory loss, you know, oftentimes the patient is really not really aware that he or she’s having memory loss. It’s typically the family members who will begin to notice it. Scott Gilbert – In what forms? What are some of the common ways in which this presents itself? Dr. Sathian – Well so for example a common complaint that I hear is that one of the family members will say that well, the patient’s always repeating himself or herself. He’s asking the same question over and over again. And that’s because what’s happening in Alzheimer’s disease is that you know, that ability as we talked about earlier to hit that store button to encode a new memory that seems to be impaired because it’s part of the brain called the hippocampus, it’s not really functioning at 100%. And there’s some things that we can do to help that as well. Scott Gilbert – Is there a certain amount of forgetfulness though that is normal as people age? In other words, you know, I think it’s very common for people to be alarmed and think uh-oh, I forgot a couple things today. I’m getting older, that could be a sign of something bad. Not always though, right? Dr. Sathian – No, no. As we were talking earlier, the you know, we forget things all the time. And forgetting is a very important part of normal memory. And as we get older, our ability to remember things tends to get a little bit worse. And so some of that is just normal. Again, if it’s not affecting your daily function in a major way, it’s probably not a cause for concern. And even if it is, it doesn’t necessarily mean that it’s dementia. Or that it pre-stages dementia. It could just be as we were talking about, maybe you’re not sleeping enough, or you’re stressed, maybe you’re depressed. Because depression actually especially as you get older can be more hard to diagnose. And so that’s one of the things as neurologists we are often interested in assessing whether our patients who have memory loss suffer from depression. Because again, that’s something that we can treat. And if we can treat it either with medications or with psychotherapy, counseling, even exercise, there’s some studies suggesting that exercise might also be helpful to treat depression. So we have all these things potentially to treat this problem, then maybe this, if the depression can actually be treated, maybe the memory loss will actually get better. Scott Gilbert – I was going to say, it sounds like the theme here is memory loss in and of itself is not what’s being treated, you’re treating the condition that is the cause of memory loss. Scott Gilbert – You’re watching Ask Us Anything About Memory Loss from Penn State Health, if you find this information useful, please feel free to share it on your Facebook page. Feel free to share it on your feed so we can help get the information out to so many other people. We do have another question from Darnell. He’s asking if you have short-term memory loss, will it necessarily get worse? Dr. Sathian – No, not always. Really again, I think it really depends on what the underlying cause of that memory loss is. As we were talking earlier, if it is due to an underlying disease process such as Alzheimer’s, then that is going to get worse over time. But you know, that doesn’t mean that every memory loss, every person who has memory loss, we should jump to the conclusion that we have something that’s going to definitely get worse over time. Because oftentimes that’s not the case. Like I said earlier, it could be due to depression, that could be treated. It could be due to a medical condition that could be treated. It could be due to simple lack of sleep or maybe just stress so that it causes you not to pay attention to important things and in those cases, you know, if you can address those problems well, then this is not necessarily going to get worse. But I think that’s a good sort of point there that if you’re worried, you don’t have to make this decision on your own. That’s when you should consult with your primary care physician and ask them is this normal or is it something else that’s going on? And your primary care physician can help you in many ways, you know, make the decision as to is this something that’s treatable or are we at the stage that we need you to be evaluated by somebody who’s more specialized? Scott Gilbert – And of course we often hear about things like crossword puzzles and doing things, keeping the mind stimulated as you get older. And you know, some people feel that those things may help. And in fact that’s kind of at the root of your question we have here from Jason, who’s asking whether those memory apps, of which there are several available now, those apps that are available for smartphones, do they help at all? Dr. Sathian – So that’s a great question. And there’s been obviously a lot of interest in this topic as to, you know, does stimulating the brain help? And so I always tell patients, I mean in a way, you can compare the brain to a sharp knife. If you don’t use the sharp knife, what’s going to happen? It’s going to rust, and then it’s not going to be so sharp, it’s going to get blunt so certainly, there is sort of an aspect of brain function that we can sort of term “use it or lose it.” So the more you use aspects of your brain, the more that’s going to build the synapses and the neural circuits that are involved in those neural computations and so that’s definitely going to help preserve brain function. However, in terms of the various apps that are out there, the computer games that have been developed, what we do know is that working at those apps and working at those games will make you better at playing those games or doing those apps, working those apps. But there’s really not good data at this point showing that you know, playing those games or using those apps is going to spill over, is going to carry over into everyday life. So certainly I think it’s good to do things that engage the brain and provide cognitive stimulation to the brain. I will say that data for that in terms of actually supporting brain function and staving off dementia is not necessarily the greatest. What we do know is that lifelong involvement of the brain in high level cognitive pursuits seems to be helpful. Because people who have a high degree of education, relative to people who don’t, or people who speak multiple languages, relative to people who only speak one language, in those people, the onset of dementia can actually be delayed relative to those other groups that I talked about. Scott Gilbert – You also talked about exercise too [inaudible]. Dr. Sathian – Right and I was actually just going to segue into that, so that’s great timing. That not only cognitive stimulation, but probably the best thing that I can advise anyone who’s interested, and I’m telling my patients this all the time, really more than any of the medications all your doctors are prescribing, I don’t know, maybe some doctors don’t like what I’m going to say, but exercise really is your best medicine. Because exercise, there’s been so much research on exercise right now. It seems that exercise actually liberates so many natural chemicals that the body has in tiny amounts really, but these chemicals seem to have very beneficial effects on really a bunch of things. And so as I tell people, it certainly improves brain function. It can improve memory. It may stimulate what we call neural Genesis, the birth of new neurons in the hippocampus. There’s some controversy over whether this actually happens in humans, but you know, I think if you consider, you know, sort of the downside, what’s the downside as long as you don’t exercise too much and don’t injure yourself, it’s actually all good. But then along with, you know, improving brain function, it also helps with so many other things. It’s going to help with weight, it’s going to help with just your overall sense of wellbeing. It can help lower your blood pressure. It can help lower your blood sugar and maybe prevent diabetes. So there’s just a lot, and of course it can provide, it improves your vascular health. Can improve, you know, can help with better you know heart health in addition to brain health. So there’s just so many reasons to exercise. And really I think you know, as a community, as a nation, as a human race, I think we should really work on improving our mobility, improving our exercise. And I think part of the reason of why we have to talk so much about it is in our modern society, you know, we spend so much time at our desks. We spend so much time sitting at our desks, so sitting in a conference, sitting and eating. Maybe we can sort of think about some of those activities we could do while we are walking around. So exercise may be not just going to the gym or going for a run, of course those are great ways, but maybe when you’re doing that conference call, we’ve got pretty good speaker phones nowadays on our cell phone or on our, you know, land lines, if we still, if anybody still has those. You know, if we walk around the room while we’re doing that. Even that level of activity can be helpful, at least to some extent. It’s not necessarily going to be as good as going for a run or going for a walk. Scott Gilbert – And then the fact that you as a neurologist are so passionate about exercise really seems to draw attention to a mind-body connection. Dr. Sathian – Right. Right. And I think, yes, I mean sort of the mind is really sort of, if you will, sort of a set of programs of the brain. And the brain’s deeply embedded in the body so there’s a very, very intimate mind-body connection that’s happening on multiple levels and just, you know, happening from multiple perspectives. And so really I think looking at things in a very holistic way and really recognizing the benefits that exercise has for brain function, I think that’s really perhaps one of the best lessons that you can take away from you know, if you have experienced any part of this encounter. And as I said, that’s one of the things that I’m constantly trying to tell my patients about. Scott Gilbert – You’re watching Ask Us Anything About Memory Loss from Penn State Health. We welcome your questions for Dr. Krish Sathian, a neurologist and chair of neurology right here at Penn State Health. I imagine there are, in addition to some of the permanent causes of memory loss that we’ve discussed, there are also some temporary causes. Can you get to some of those? Dr. Sathian – Yes. Yeah. So there, as I said earlier, there’s things like medications, there’s certain medications that can impair your memory. And certainly if you stop those medications, then the memory loss in those conditions is going to improve. Again, with stress or depression, those may tend to cause more short-lived memory loss. If you have a head injury. Scott Gilbert – Head trauma, sure. Dr. Sathian – Yeah. For example, we’ve all heard about concussion, concussion on the football field. Or in any kind of sports encounter. If you hit your head, and particularly if, you know, if it’s hard enough that you get knocked out such that you may actually pass out, you may impair your memory transiently. And then that’s going to get better over time. In fact, there are times when you might hit your head hard enough but not hard enough to pass out and then but you might actually what we call post traumatic amnesia. So you might actually just have a blank period for, you know, the time just before and just after your hit your head. And we call that post traumatic amnesia and that can be an indication that there was an injury to your brain sufficient to actually cause that memory loss. But that’s going to get better over time. And again, one of the things that we try to do there is you know, to try to help that healing of the brain along, we try to minimize stress. We try to get people to exercise. And if necessary, sometimes we use medications, especially if they have headaches and so on and so forth. Scott Gilbert – We have a question from Darnell who’s asking what kind of things can you use to help your loved ones who have short term memory loss to help them remember days, events, et cetera. Anything you recommend as aids or tools for those folks? Dr. Sathian – Right. So I think that’s a good question. Now if it’s really due to something like Alzheimer’s disease, or maybe a patient had a stroke and has memory loss as a result of that, that can be hard. But one of the things to remember is that you can encode a memory much more richly if it’s what we call multimodal. That is, you have different inputs to the memory. So instead of just telling somebody something, if you can give them a visual cue to help them bind to what you just told them, so maybe show them a picture or mime an action, that kind of thing. Remember, you know, in school, our teachers always told us don’t just listen to what the teacher’s saying, write it down. And that’s helpful for your memory, right? Because now you just have not only the auditory memory, but you’ve got a visual memory, you just wrote something down, and you’ve also got a motor memory. So you have these multiple sources. So taking advantage of that, people have actually designed what are called mnemonic strategies to help support memory. So what I tell patients is that if you can try, there’s something that’s important, try to make an association with that. And if you can make the association a little bit funny, that can help you remember that a little bit better. Scott Gilbert – Humor as a device, huh? Interesting. Dr. Sathian – Humor as a device. Because people tend to remember funny things a little bit better than, you know, non-funny things. So yeah, try to make an association and try to make that association meaningful to you. And if it’s a little funny, that helps. And obviously now, you’re not going to be able to do this 100 times a day. But maybe a patient can focus on doing this one or two times a day for a couple of things that are particularly important. So that’s one thing that you can do. The other thing that I often tell people to do is that, you know, so the hippocampus is going to be very important for this kind of memory that we call declarative memory. That’s memory for facts and figures, and that’s the kind of memory that typically is what we lose if we get dementia. But there’s another kind of memory, which we call habit memory, which depends on different neural systems and is typically not affected by something like Alzheimer’s disease. So if you’re forgetting where you kept your keys, you can try to circumvent that problem by keeping, getting into the habit of putting your keys into the same location every time. Every time you take your car, if you bring your car back home, put your keys back in exactly the same place. And maybe you can make a little hook, you know, on a particular stand, so it’s always there. So then by force of habit, you’re just going to go to that place and find your keys. So that’s another device that can help with memory loss in the context of disease such as Alzheimer’s disease. And indeed, which is just sort of normal aging for things that are important, you try to rely on some of these devices. Scott Gilbert – That’s great. Those are some great tips. You know, earlier you mentioned that the primary care physician may be the first stop for somebody who thinks that they may be having some memory problems. But what’s your advice for somebody who notices these symptoms in a family member? What’s the best way to bring up the issue with that individual to say, you know, I really, you know, basically just to help them seek out the help that they may need but that they may resist? Dr. Sathian – Right. I mean, so that’s I think a great question. And that can be very difficult. Because one of the things that as physicians, as healthcare providers, we don’t want to do, is we don’t want to take away people’s autonomy, right? And one of the things I try to emphasize to patients, even patients who have sort of early Alzheimer’s disease, is that most of your brain’s actually working normally. It’s only a teeny-tiny part of the brain that’s not working quite so well. Now it can have these pretty major effects, but in that context, I think what’s really good is the family members really need to understand what’s going on, need to appreciate what’s going on, need to be sympathetic to what’s going on. And my experience has been if it’s put in the right context, and explained to the individual that hey, there may be something going on here. Let’s go check it out. Let’s make sure that you know, we can figure out exactly what this is due to. Because again, as I said earlier, there might be things that are very easy to treat that we shouldn’t lose sight of. If it’s simple thyroid function that’s abnormal, we don’t want to miss that because we can treat that quite easily or a deficiency of vitamin B12, we don’t want to miss that because those are easy to treat. And then if it is something like Alzheimer’s disease, I think it’s important to note that earlier because there are clinical trials that are going on, there are new treatments that are being studied. Unfortunately we don’t have any treatments right at the moment that can cure Alzheimer’s disease, but a lot of people around the world are working very hard to try to come up with new treatments. And really new understandings of how the disease actually arises and then hopefully new treatments. So I would say that that’s on the horizon. And maybe within our lifetime if we are lucky, we will see some of those treatments come in. And then there’s lots of things that we can do even in the absence of curative treatments, there are lots of treatments that we can do in terms of medication or recommendations about exercise or managing blood pressure and so on, so forth, that can improve the overall quality of life and so I think there is a good reason to bring it to medical attention. Scott Gilbert – Because I’ve heard people ask what’s the use in being diagnosed with something for which there’s no cure or even really reliable treatment. But you’ve answered that question here in the fact that there are clinical trials happening. There are some treatments that are thought to help some people. And the field of research hopefully will keep getting better in that regard. Dr. Sathian – That’s right. That’s right. I think, you know, I couldn’t agree more with everything that you just said, Scott. But also, I mean even if a person has a bad disease, it doesn’t mean we don’t have any treatment at all. There are medications and other kinds of interventions. Sometimes rehabilitation, cognitive rehabilitation, or cognitive training, can help people improve their function at least for a couple of years. And that can buy some very valuable time that you know, people can really, you know, you spend a couple of years extra quality time with your family and I mean, that’s invaluable. Scott Gilbert – What do we know about genetics and things like Alzheimer’s disease? Is there a genetic link? Dr. Sathian – So that’s an excellent question. So it seems that there are some genetic risk factors for Alzheimer’s disease. And there are certain forms of Alzheimer’s disease that appear to be inherited. But those inherited forms really account for a pretty small proportion of patients with Alzheimer’s disease, maybe about 5%. So these are the actual genetic changes that can actually you know, predispose to Alzheimer’s disease. And then there’s a sort of, another group of what we might call just risk factors. Where it might increase the likelihood that you might have Alzheimer’s disease but it’s not going to guarantee that you have it. And so there’s a lot of research going on and people are trying to use those genetic risk factors as kind of probes to understand exactly what causes Alzheimer’s disease and hopefully that’s going to improve our overall understanding of the disease. So I think the take-home message is most of Alzheimer’s disease appears not to be genetic, although there’s maybe a subsection of it which is. Scott Gilbert – And so the takeaway message for any age then is any concern over memory loss, see your primary care physician. And perhaps the path will lead here to a neurologist here at Penn State Health, or perhaps it’ll be you know, a much easier fix. You never know. Dr. Sathian – Yes, you never know. So I would say yes. I mean, it’s a good idea for people who are not doctors not to play doctor. And also, this applies to physicians. We as physicians, we don’t try to diagnose ourselves. So there’s a problem, you know, go to your primary care physician, hopefully somebody you have a relationship with, somebody you’ve trusted over the years. And he or she can direct you as to whether this is something that’s simple or does it require, you know, further evaluation by a neurologist. Scott Gilbert – Thank you very much, Dr. Krish Sathian. We appreciate your time today. 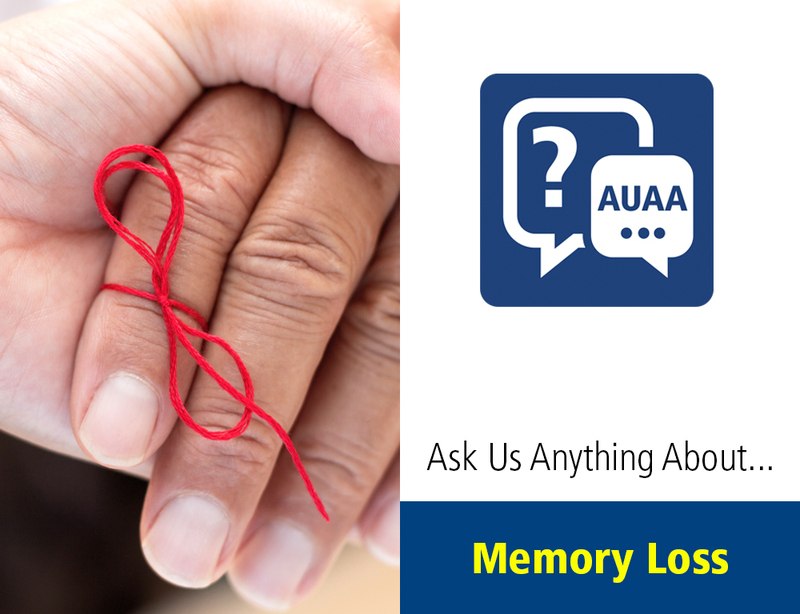 We appreciate your great questions and you watching Ask Us Anything About Memory Loss from Penn State Health. Dr. Sathian – Thank you.